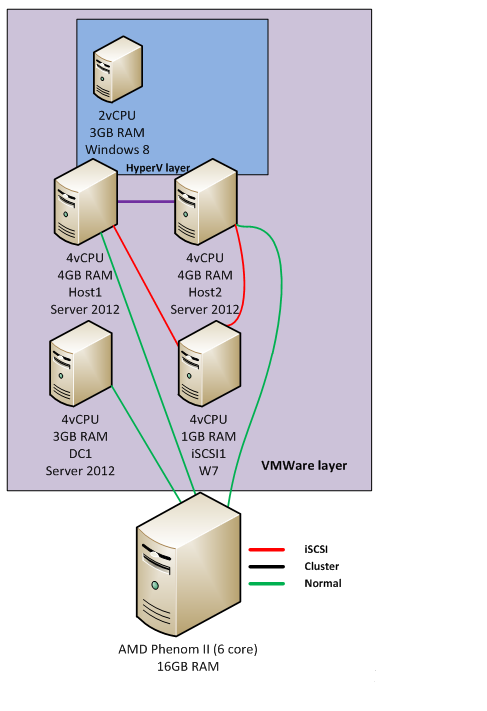 For those of you that want to learn but just cant afford all the hardware to get virtualization up and running as it would be in a business data center, here’s a poor mans hyper v cluster design. This design gives you the chance to setup and configure hyper as it would be on physical hardware. However there are a few draw backs. With every virtual layer you add the solution gets a tad slower. It’s noticeable in this solution but, is still more than adequate for a lab setup. Also you cant do any magic with bonded nic’s and other things that require special hardware but, again this lab is not meant for that. 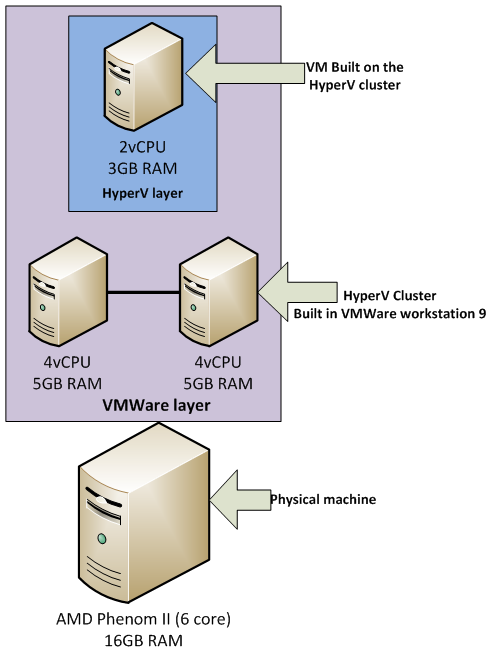 This lab will give you most the functions of hyper v and a place to play with them. Here’s what i have built on it. Wondering how to do it ? Well its actually quite easy actually. I used VMware Workstation 9 for my deployments. I believe that you can also do this in workstation 8. 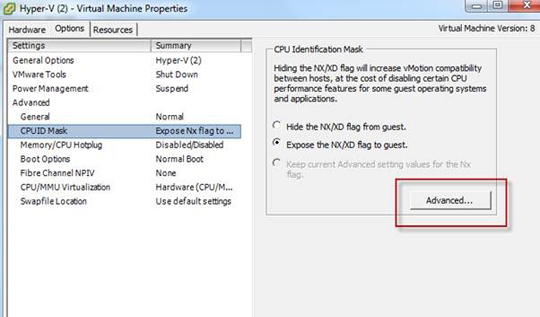 Create your virtual machine as required and turn on Intel-VT/AMD-V virtualization. Go to the folder that contains the Virtual machines configuration files and open the .vmx file with notepad. Add the following line to the bottom of the fiile. Now save the file and start up your VM. You should now be able to enable the Hyper V role. Well in step 1 we “Enter the BIOS” and enable the settings on the CPU in a way. In step 2 we are tell VMware to not advertise to the Virtual OS that its being hosted on virtual hardware. Hyper V checks for this when you enable the rule. This can also be done in ESXi 5. I haven’t done it ESXi so this is a clipping from another blog. 1. Before anything you need to place an entry in the /etc/vmware/config file found in the tech support mode on your ESXi 5. I enabled SSH through the security profile in the vSphere Client. Then used putty SSH into the ESXi system. 3. Now create a virtual machine using version 8 hardware, 4GB (or as much as you can spare), 2 x vCPUs, 2 or more vNICs and a 100GB virtual disk. 5. 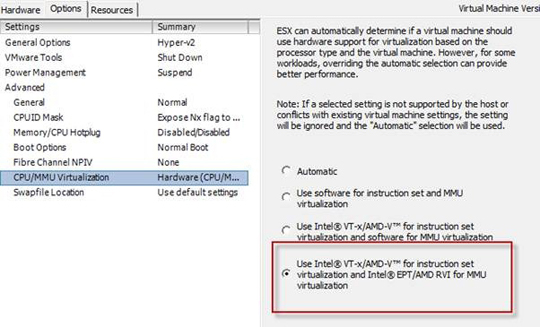 Now back in the VM settings > Options > CPU/MMU Virtualization make sure you have the option to pass the Intel EPT feature. 8. Now Install Hyper-V or Windows 2008 R2 and enable the Hyper-V role. 9. You are ready to roll. Thanks to http://www.veeam.com/blog/nesting-hyper-v-with-vmware-workstation-8-and-esxi-5.html for that clipping. Now you know Go out and create something great. Hi there very cool website!! Man .. Beautiful .. Wonderful .. I’ll bookmark your blog and take the feeds additionally?I am glad to seek out a lot of useful info here within the put up, we need work out more techniques in this regard, thanks for sharing. . . . . .
It’s really a cool and useful piece of info. I am happy that you simply shared this helpful information with us. Please stay us up to date like this. Thank you for sharing.